As believers, God has given us all unique talents and abilities and this is our time to arise and be the difference in the world we were destined to make! Acts 1:8 says "...you will receive power when the Holy Spirit has come upon you and will God's witness throughout the world". Whether a parent raising children in the ways of God, an employee or manager, a teacher, student or professional, we each have an integral role to play in releasing the culture of the Kingdom of Heaven on Earth. Planetshakers music is now sung regularly in churches all over the globe. 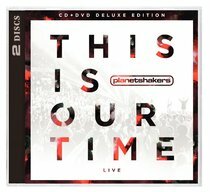 The newly released This is Our Time album, recorded at Planetshakers Melbourne Awakening in April, 2014, delivers a fresh, uplifting and God-centered live praise and worship experience that is sure to encourage listeners to lift up the name of Jesus and stand tall in who God has called them to be. Amongst the many songs, 'Covered' - co-written by Israel Houghton and the Planetshakers Worship Team - stands out for its passionate reminder of the lavish grace of God and is sure to become a church worship classic. Other powerful tracks include 'Leave Me Astounded', 'It's Your Love' and the title track 'This Is Our Time', which captures the current revelation unfolding at Planetshakers Church and beyond - that God is awakening His bride for such a time as this! About "2014 This is Our Time Deluxe Edition (Cd/dvd)"
Customer Reviews For "2014 This is Our Time Deluxe Edition (Cd/dvd)"
Solid praise and powerful worship! Planetshakers absolutely nail praise, and This Is Our Time is no exception. But that's not to say that their worship tracks are lacking, because they're incredibly powerful and have created greate opportunity to encounter God and His love! CHECK IT OUT! Wow! What a fantastic album, I would definitely recommend to anyone. This music and lyrics are upbeat and always lift my mood. Ever since attending their 2014 Melbourne Awakening Conference, Planetshakers have been my number one Praise and Worship choice. The beat, energy and inspiration capture the essence of today's youth and young adults. If you were to ask me, I would prefer Planetshakers over contemporary radio!! This is the second album that I own, and for me is the most meaningful as the lyrics capture the essence of Christianity. I believe Christ is being glorified through their songs.